I've just realized that every winter, generally sometime in January, I start doing drawings based on photos I've taken. I think that this is because I feel a need to exercise my drawing skills. They're really not getting exercised much in field sketches because I'm just not getting out much or if I do it's too cold to sketch. This year I'm sure the desire to do accurate, careful drawings is also related to the simplifiication that I use in my linocuts. So I feel like I get back in balance my sketching. 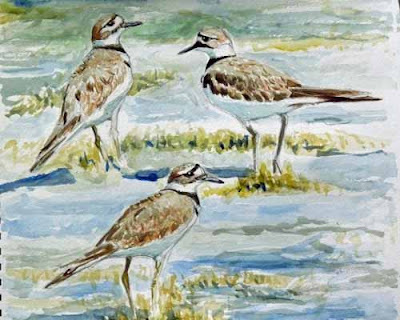 The watercolor at top is based on some photos I took of Kildeer at Morris Arboretum late this summer or early fall. I did three detailed pencil sketches then added watercolor. At one time this method only inhibited me. I was far too cautious about not getting outside the drawn lines with watercolor. Now I realize that the lines are just a guideline. I notice them but try not to be limited by them. It's a truism of art that drawing is the foundation of everything else. Well every once in awhile a truism is actually true, at least for me. And I'd have to say that at least 90% of my favorite artists, wildlife or otherwise, are skilled draftsmen. There's just something so satisfying about changing a three-dimensional object into a believable two-dimensional representation. Even during the many years that I was an abstract artist I loved drawing, especially from life. In some ways I suppose it's like music. At least for many people there's an innate impulse to draw, just as there is one to sing and make music. In any case that impulse to draw is I think what got me to create this newest watercolor, 11x14 inches on Strathmore 140# watercolor paper. It may sound weird but I probably feel as strongly about a great blue heron as Matisse did about a female torso(I'm only talking about aesthetics of course). If artists supposedly reflect the concern of their times, then today when nature is the greatest concern on a global scale, I suppose nature's images would be logical for a contemporary artist. I finished off this wonderful book by David J. Wagner right in the middle of my latest linocut. What struck me about this quote is that it gets to the heart of the primary subject of this blog: art that is based on nature, not just nature, not just art, not just nature sketches, but ART in capitals, that uses nature as its subject. I'm using a bit of hyperbole in saying ART in capitals but just a bit. If you think of the best art, whether it's music, literature, painting, sculpture, novels or whatever you know that it has high aspirations. And it must meet at least some of them or it wouldn't be widely recognized. My background is fine art, where at least in theory the goal is to create art in caps. Of course much doesn't and much is preposterous, bombastic nonsense. But the goal is honest I think. However for the last 100 years or so I don't think that there are many in the fine art world who really even consider art with nature as its subject as being fine art. By definition it is a lower form of art. Now I know that this is nonsense and it's a very foolish, arrogant attitude. Nonetheless it's there. 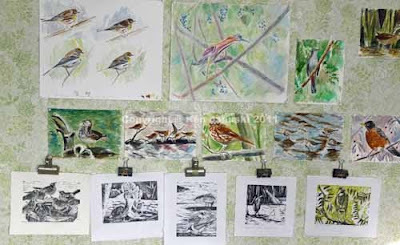 Wildlife Art Journal often touches on this theme as well. But I've yet to read an argument that I think will hold water in the fine art world. Until I read the Kent Ullberg quote above. Nature is a overriding concern throughout the world today and it only makes sense that ambitious artists should use it as their theme. That said I thought in the back of my mind as I concentrated on finishing the linocut that when I was finished I'd write a post such as this and illustrate it with a quick Great Blue Heron watercolor. But as I looked through my photos I got distracted by my photos of Black-throated Blue warblers from this fall. Perhaps I care as much about them, and the Hercules Club that they feed on, as Kent Ullberg feels about Great Blue Herons. Sad to say much of the breeding habitat of this beautiful warbler is being threatened by indiscriminate energy exploration and extraction in the Marcellus Shale fields of Pennsylvania. This seems like it's been a long haul. But I finally printed the final edition of 16 of the Wood Ducks seen along the Wissahickon this summer. There are a total of 5 colors in this reduction linocut. By the time I got to the last color, the light blue, I found it hard to roll on the ink without getting it into areas I didn't want. That's because 95% of the block had been cut away. So there were only a few small areas to ink. Even with a small roller that I applied to each of the areas that needed to be inked some of it migrated elsewhere. This also was a surprise because those areas had been cut really deep, I thought deep enough that I wouldn't have to worry about the roller touching them. All in all I'm happy with this though. It's taken some liberties but that's one reason I like linocut. It lends itself to taking liberties, to abstracting, to creating a higher contrast than might actually be seen. Not everyone of course uses this medium in that way. 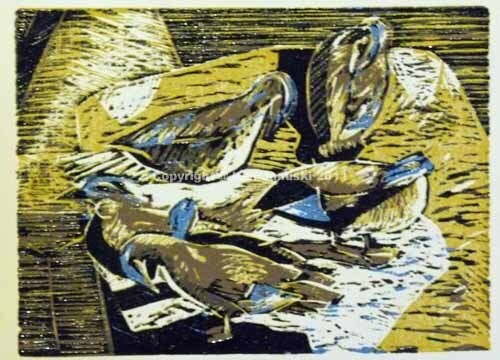 Robert Gillmor for instance is much more precise, as is Andrea Rich in her woodcuts. And yet I think both also tend to use the higher contrast that seems so natural to these media. Linocut and woodcut seem like the perfect blend of realism and abstraction. The print is on Rives BFK paper, 9x11 for the full print, and 6x8 for the image itself. It is an edition of 16, printed with Gamblin oil-based inks. 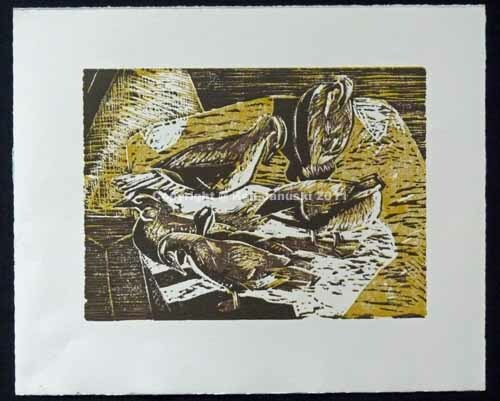 Though accepted wisdom in reduction linocuts is to print the lighter colors first I had some misgivings about this when I printed color number two of this Wood Duck linocut. I was somewhat afraid that I might lose some of the dark defining lines that were there if I used a lighter color second. I've spent the last two days experimenting with color number three and cutting away more linoleum. Though there is a lot that I like about its current state at top, I do think I've lost some of those defining lines. So it's gotten harder to tell one duck from another. It's becoming harder to read though maybe more striking as just an abstract design of shape, value and color. As I add colors problems of registration also become more apparent. I use a rough and ready system that has worked well enough so far. But it's not a finely tuned system. The original image I posted here showed some registration problems. I hadn't seen them when I chose it to photograph. But most of the prints are better so I've substituted the more successful one now at the top of this post. One additional problem with reduction prints is that a lot of areas are now cut away. There is no way that I can go back in and add defining lines, well outside of carving a second block that is. All that's left to work with is the remaining uncut linoleum. As far as the third color goes I spent a very long time testing before I finally decided on this one. The main problem was that blue or green looked better but brown was truer to reality. Eventually I ended up with this compromise. Still to come are a dark blue/black for shadows and dark parts of the ducks, and possibly for the water and rocks under the water to the left, as well as a lighter blue for a few highlights, especially for the speculum, of the ducks. But only time will tell what colors actually make it into the print. I spent much of yesterday carving out the area where color number two would print. Then I spent more time trying to decide on the actual color. As I said in last post I'm mixing colors in this print. So I can't go straight to the tube or jar. I have to mix the colors, make a test proof and see what I think. At one point I decided I wanted a little green in the brown that was going to be the second color. Well my proportions were off and instead I ended up with the deep slate blue of photo number two above. The problem was I loved it! The strong contrast with the white of the paper and the golden brown of the first color just looked great. The first color I tried, more of a burnt umber tin, is the final photo above. Though I liked it I much preferred the second darker, bluer color. However if I kept it then I had to either make the Wood Ducks a darker, bluer color than they really were, or I had to go on top of the dark blue with a lighter brown color. This should work but would it? I wasn't sure. There was one other reason to go with the dark blue. The darks, including the blue-black that lies ahead as a future color, are a very important part of the print. If I got them at this early stage then I knew I didn't have to worry about losing them. If a lighter color overlapped I could do a test proof, see that, and carve away that lighter area so the dark stood out. This latter reason was a real temptation. But in the end I decided to do the unintuitive and use a lighter brown, trusting that I'd be able to put back the dark blue-brown on the third color. That is the print at top. It's on Rives BFK paper. The other two are just tests on copier paper. For the future: the dark blue-brown, a blackish blue, probably some light blue accents on the wings. I'd really like to get a green tone in the water, as I actually saw. But for the moment I think that may be too much. I was just reading Robert Bateman today saying that as he uses colors he may plan A, B, C and D. But he noted the same problem I did yesterday. Each color affects the next. So once I put down the color C it will change how colors A, B and any future colors look. Stay tuned. One last thing. For me this is the exciting part of printmaking. I don't really know what will happen. I can just use my best judgment based on years of experience, then improvise if necessary. 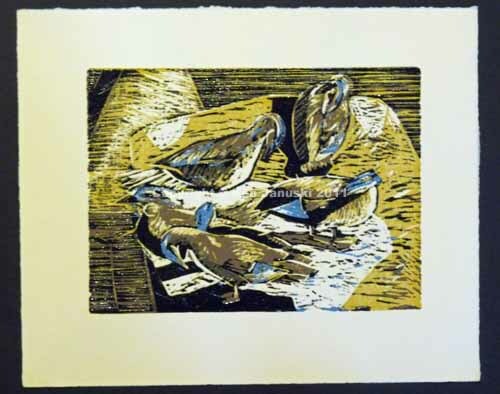 After a number of days doing sketches, thumbnails, watercolors of the immature and female Wood Ducks that I saw along the Wissahickon this summer it was finally time to get started on the linocut. I began yesterday and decided early on that it would be a multi-color reduction cut. After I print each color that part of the block is cut away so it can never be printed in that color again. This is a lot of work but seemed like the best method for this scene. As it will only be my second reduction cut I'm not brimming with optimism but I'm not scared off either. Sometimes certain methods just inspire confidence while others inspire dread. I have confidence with reduction cuts. My guess is that this is because linocut is a rough, inexact and forgiving medium. I'm also taking another new direction here: mixing colors. 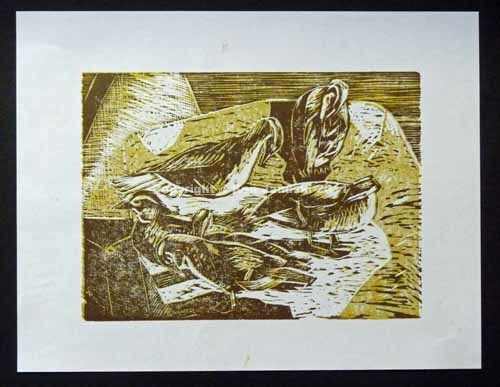 I mixed a couple colors in my reduction print of the Yellow-crowned Night Heron but basically I've stuck to out of the jar colors with linocuts. I'm so new to the process that I didn't want to add to the confusion by mixing my own colors. That changed here. The print at top is the first color. It's a goldish brown, intended to be reminiscent of slow moving streams in the sunshine in summer. They're muddy looking, but also have a golden glow. Future colors will probably include a blue for portions of the wing, a green, or maybe blue over the golden yellow for some of the water, brown for the bulk of the ducks, and a black or dark blue/black/brown combination for the darkest areas. As many have said though, color doesn't exist in a vacuum. All future colors have to work with the current colors. So once I start the second color I'll see how it works with the golden brown. My guess is that a fair amount of color changes will ensue. I pulled 16 prints on Rives BFK paper today, along with 20 proofs on printer paper. I'm sure I'll run through those 20 proofs quickly as I try out future colors and cuts. I'm almost certain that 20 won't be enough. But 36 pulled prints today was more than enough for me to say: enough! P.S. The second photos shows an earlier proof using a darker color. Only over time did I get what seemed to be the right color. The actual linoleum block is also there, both on my old woodworker's bench hook, which is ideal for holding the block as I cut it. If there in one thing I have very reluctantly learned over 40 years of artmaking it's the need to simplify. I say 'reluctantly' because I never really learn it. Instead I struggle through some works, finally arrive at something that seems satisfactory and is also much simpler than where I started. At that point I relearn the lesson that I ought to simplify. It works. And yet sometimes you want to enlarge your experiences and start from new and bigger material. I think you also need to expand your horizons in order to grow. But when I do I always find that I'll eventually need to strip down and simplify the new material or the new way of working. Not everyone of course loves simplicity. But for me it is the best way. I'm not sure that anyone would guess that from my work, but it is my own conclusion about it. That said you may wonder about these two photos. Sort of a mess. Somewhat in need of simplification. Sure enough. This watercolor and pencil sketch are based on some photos, and bad field sketches, I did of female and immature Wood Ducks along the Wissahickon this summer. 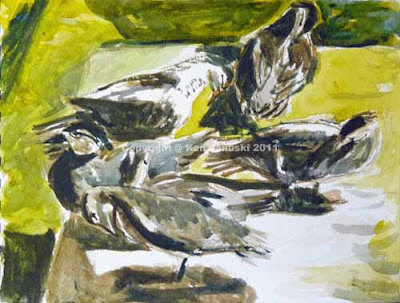 I've always loved the light in the photo as well as the grouping of birds. I'd like to make a linocut of this. I haven't yet decided whether or not there will be more than one color. Adding colors and carving reduction linocuts certainly ups the complexity. I'll decide on that later. 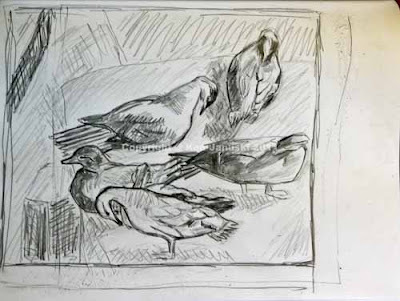 For now I'm experimenting with how I can take this subject and do it as a linocut, concentrating on line and contrast. 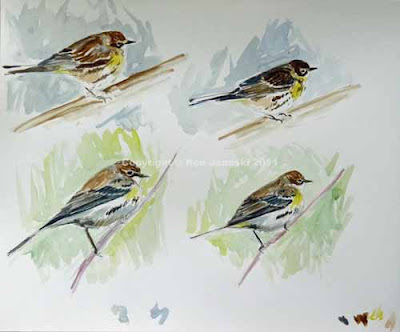 You might say how could he make such a sloppy watercolor after the more detailed and controlled watercolor of the Yellow-rumps a few posts back? I can do it because I'm using watercolor more like a lino, trying to concentrate on lines and contrast. I admit it's rough. But it is intentional. I'm trying to simplify the scene so that it will work as a linocut. I imagine there's still a lot of simplificaton that awaits me. 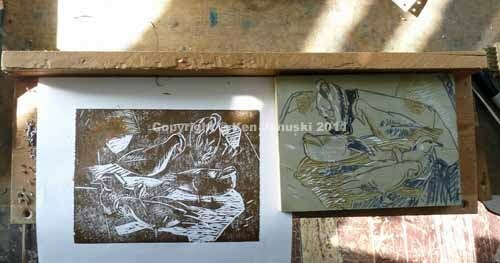 But I thought it might be interesting to see the steps on the way to what I hope will be a successful linocut. As an aside I'd also like my linocut style to leak back into my watercolors. I'd like to have bolder, more abstract watercolors. This means that I'll do less of the more subtle, detailed ones like the Yellow-rumps. There's nothing wrong with such work, and I'm happy with that painting. But I think my personal tastes runs toward something more bold and lively. I hung up rhe last of my recent prints today on the wall where I temporarily hang recent work. That wall also includes the newest watercolors as well as a few older watercolor sketches from this summer. I guess about once a year I like to take a photo of this wall and publish it. And each year I think: "Boy that lime-green wallpaper sure is distracting." I always think I ought to tear if off but it never reaches the top of the priority list. Why show a bunch of works, especially with this horrible background? The answer lies partly with art collector Albert C. Barnes and partly with the Paris Review. When I was young I used to read the interviews with writers published by Paris Review. I loved getting some idea on how writers actually worked. That's part of my motivation here: to show a collection of recent work all together. I think it might give some idea as to how I work for anyohe that's interested. It gives some context to my work. And the eccentric Mr. Barnes? Well I doubt he really was all that eccentric. This was just a tag plopped on him by lazy journalists. You have to wonder if it wasn't the art establishment getting back at someone who had snubbed them and who had much better artistic judgment. It was that same artistic judgment that disallowed color reproduction of his collection. Why? Because it's so misleading. At the time color reproduction was probably much worse than now but that doesn't account for qualities like scale, surface, texture that reproduction misses. Barnes was right to hold out for the primacy of the art itself. If you want to enjoy it, and if you really respect it, then go and see it live. See the real thing, not some poor reproduction. He'd be sad to see that to day we live in the Age of Poor Reproduction. How many people even see live things, whether they be paintings or owls? Artists and nature lovers have something in common here. A respect for the real, not for the poor reproduction. I'm not about to invite all readers of this to come by and visit my studio in the interests of a more 'real' experience. But at least by showing this group photo I give viewers some sense of the scale of the works. It's one small step toward reality. When I lived in San Francisco I happened into a tourist gallery. There a salesman demonstrated an ersatz Rembrandt landscape with a light that illuminated it from behind, making the painting glow. I had to leave when I saw that. But that is exactly what a computer screen does. It illuminates paintings from behind making them more vibrant than they ever can be in real life. So ugly as my lime-green floral background is it does bring a dose of reality back into my work. For real art, and real nature, visit a museum or take a walk in the woods. It's refreshing to see the real thing. Yesterday I took part in the Philadelphia Mid-Winter Bird Census. I don't think it got above freezing all day and it snowed during the 2 1/2 hours that my group birded. What a beautiful day. There's something about being out birding in the snow. But the birds didn't seem to agree. It was the smallest count I've been in during my five plus years of taking part in the census. My guess is that most of them were hunkered down, waiting for warmer, dryer weather. One of the many pleasures of birding, particularly birding the same area time and again, is that you get to know what birds should be there, what birds you've seen on previous counts. A Lincoln's Sparrow there. A late Eastern Towhee there. There the lone Tree Sparrow of the year. 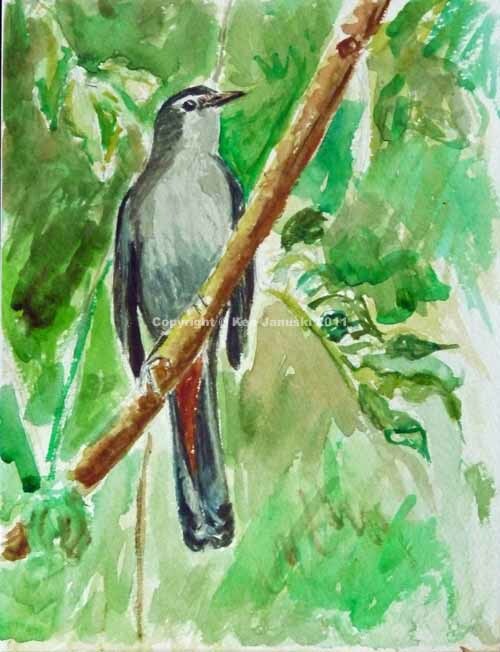 In much of the area we traversed yesterday I couldn't help think: hmm, well a Gray Catbird could still be here. 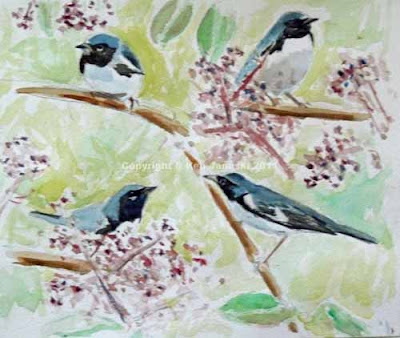 They are everywhere in the summer, non-stop chatterers and squawkers. And one or two will occasionally still be around for this mid-winter count in Philadelphia. But I saw none yesterday. One close relative though, another mimic, the Northern Mockingbird, did finally make an appearance where he's been in previous Januaries. It was looking unlikely then up he popped. That's the virtue of knowing one area, often called a 'local patch', well. You know what birds are likely to be there. So you spend the time to check that area. Yesterday it paid off. I've not given up on printmaking. Just taking a break, slowly looking for new subject matter. Printmaking takes a bit more planning that paintings and drawings. So I'm spending a lot of time looking for something that strikes me as a promising for a new linocut. In the meantime this fairly quick watercolor of a Gray Catbird seen this summer. I mentioned recently that I often like to change media. This seems to help keep me fresh. But it's also true that sometimes a bird calls out to be rendered in a certain style. I took a number of photos of Yellow-rumped Warblers at Cape May, NJ in early November. These warblers can drive birders nuts in the fall because sometimes it seems that there are 100 of them for every other warbler. It's easy to ignore them. And yet in fall they do have a really subtle and delicate beauty. It's that delicacy that I saw when I looked at some photos I'd taken of two different birds. Such delicacy seems to call for an equally delicate medium. My first thought was to sketch these in pencil, then add the color with my old nemesis watercolor pencil. But after I had the sketch done I just had to use watercolor instead. If you can master it then watercolor seems to do what watercolor pencils intend to do, just much better. So, holding my breath, out came the watercolors. I am happy with these, though they still don't do justice to the beauty of the birds. 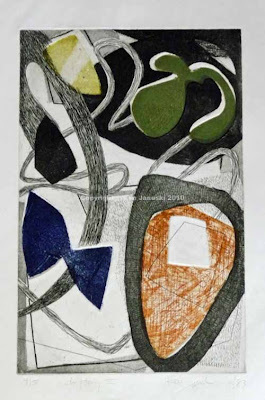 As I mentioned in an earlier post my interview for Printsy, the Printmakers of Etsy, was published online yesterday at Printsy. I had no idea when I decided to join Printsy about six weeks ago that I'd be lucky enough to get a published interview. So thank you Etsy, Printsy and Diane Podolsky of Printsy for setting up the interview. I did have trouble deciding how to illustrate the post announcing this though. It didn't make sense to put up one of my recent linocuts since they've already been seen here quite recently. So I hunted through my old prints, prints that I haven't looked at in many years. Both are over 25 years old. 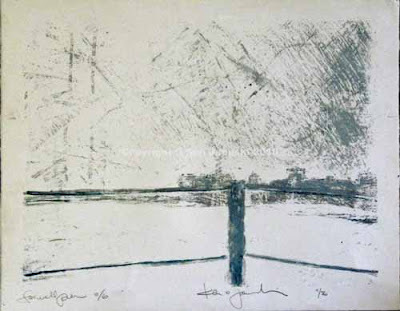 The top one is the oldest, a lithograph of a wintry view from Farwell Pier on the north side of Chicago. I learned lithography in the basement of the student union at UC Berkeley. I had moved to Berkeley from San Francisco in the summer before fall classes started so I wanted to be doing something. The classes at the student union were a lifesaver. I learned a lot about lithography and etching in a short time. But I don't think I did more than two or three lithos. In fact I can find only two. Once I started classes I found that I loved painting so much that I never took an actual printmaking course in the art department. Painting was just too exciting. 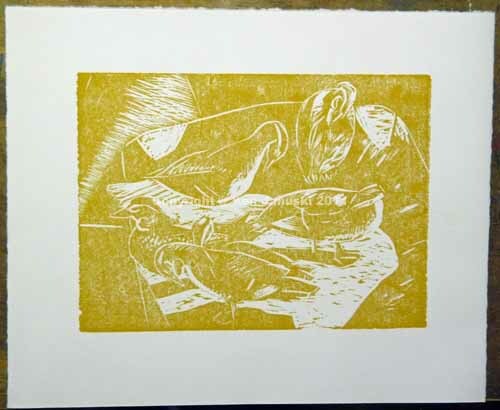 And yet about 7 years later I did the above etching at Centre College of Kentucky where I was finishing two years of teaching art. I must have had nothing to do other than read while I was there because I don't know where else I would have gotten the experimental ideas that I used in this print. Some of the shapes are embossed. My guess is that I first printed the black and white section, then printed various colored plates all cut in the shapes that you see. What is so odd about this, and something I indicate in my Printsy interview, is that I barely remember these. I don't even remember a print studio at Centre even though I taught at least one course in it. I don't remember the process that I used in this print even though it must have been a complicated one. 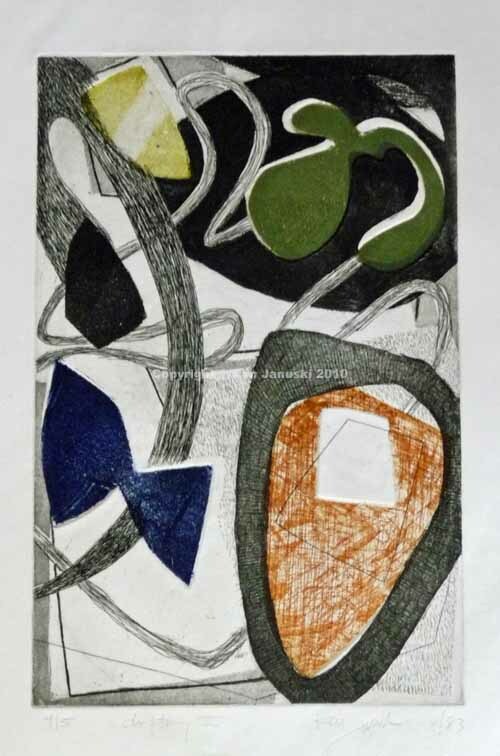 In any case this print looks quite similar to the abstract paintings I was doing at the time. Perhaps artistic adventurousness convinced me to find some way to transform those paintings into etchings. So I'll end this trip down Printmaking Memory Lane. But it has been enjoyable looking at these old prints. And they prove to me something that I said in the interview. I've spent very little time studying printmaking. I barely remember making many of the prints that I made in the past. And yet the opportunity to make prints, whether at Berkeley or at Centre, always seemed to be there when I felt like making prints. 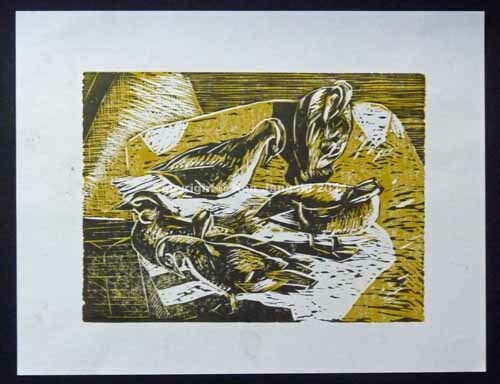 Today I no longer have access to a printmaking studio or press and have printed all my linocuts at home by hand with a baren. If I get much more involved with printmaking I nay need to see if my lucky streak holds out of finding a printmaking studio just when I happen to need it.